Before I start, I should warn you: this method involves sewing. Not a lot of sewing, or complicated sewing, but the ownership of sewing machine and the ability to turn it on and thread the needle is required for this project. Does that terrify you? I get you. For years, every time I tried to sew something, I ended up with a knot of thread instead of a nice line of stitches. I was that person searching "No-sew curtains" on Pinterest. Iron-on hem tape was my best friend. Then, one day, I took a sewing class. For four weeks, me and my sewing machine showed up to this adult education center and let these two nice ladies coach us through simple projects, which I promptly wrapped up and gave to my mother for Christmas. And now, I can sew. Sort of. 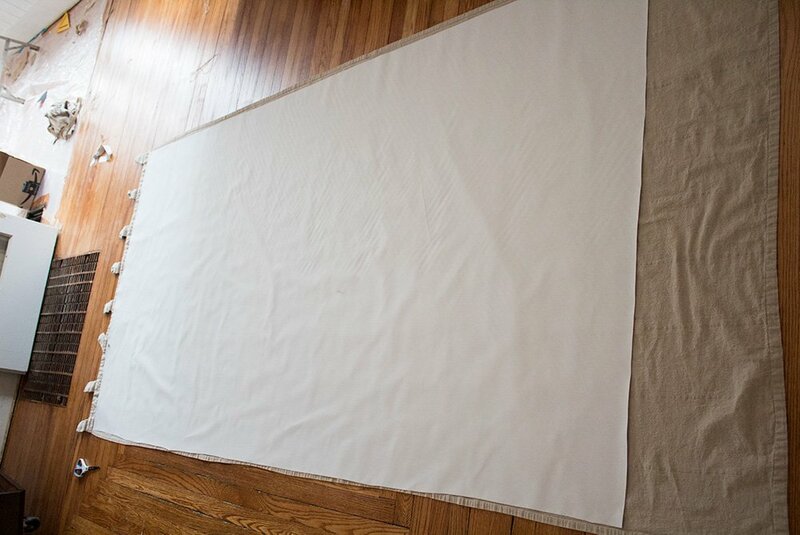 I would be a poor person to contract as your personal tailor, but I can stitch a straight line, which is pretty much all you need for basic home DIY projects. There are two morals to this story: 1) This project is not complicated. If my novice-sewer-self could get this done, you probably can too. 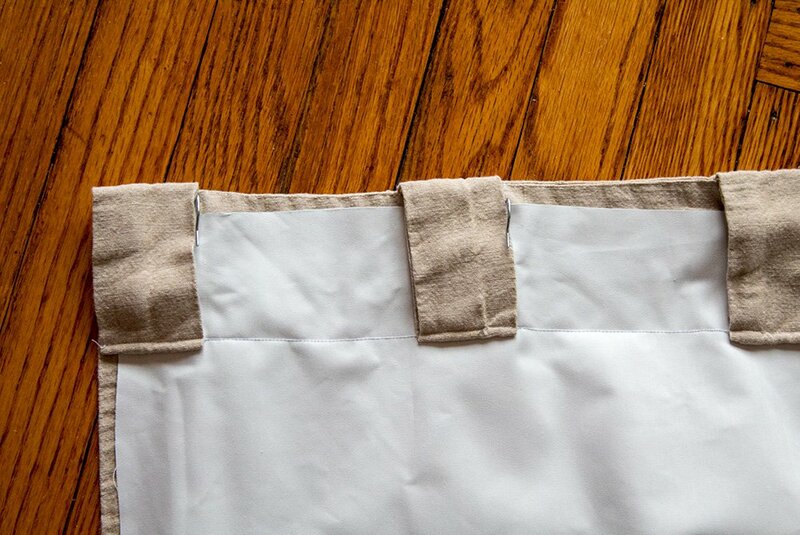 2) If you're that person searching "no-sew curtains" on Pinterest, take a sewing class. It will provide you with some basic proficiency. Most craft stores offer them monthly. 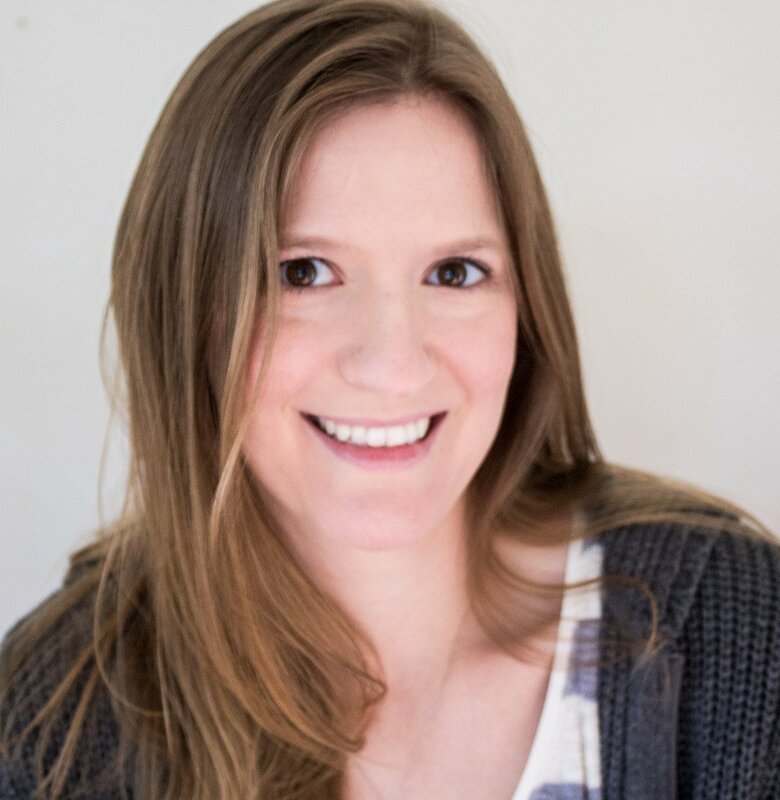 If you want something a little more unique, many school districts/cities/counties have adult education programs that include classes like sewing and photography. Store Bought Curtains- I used Ikea Lenda curtains. The nice thing about (some) Ikea curtains is that they come in 118" lengths, so they can be hemmed to fit your window perfectly. Lining- I used the Roc-Ion Blackout Lining from JoAnn's. I live alone and get really freaked out about people seeing into my house at night, so I prefer blackout lining on all of my curtains. However, JoAnn's has a decent selection of other drapery linings as well. Matching Thread- I do my best to pick thread that is the same color as my curtains, so if/when my stitches get squiggly, they're less noticeable. 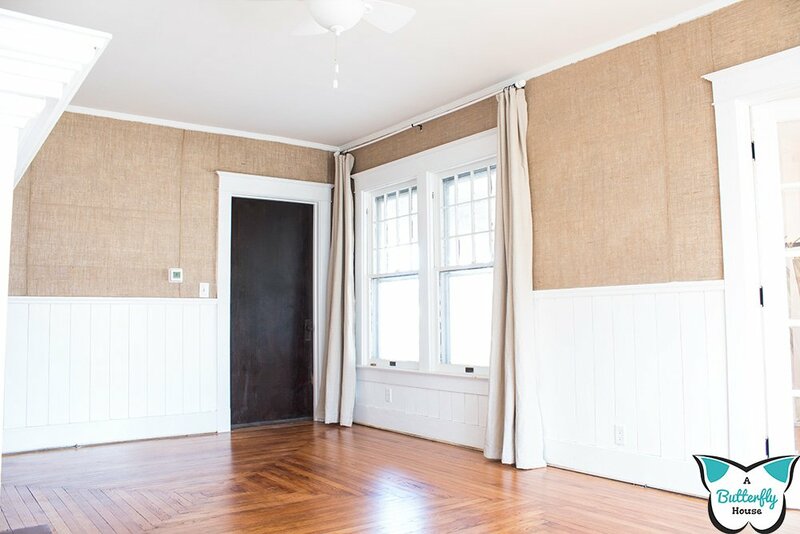 Clear out a large space and lay your curtain on the ground. 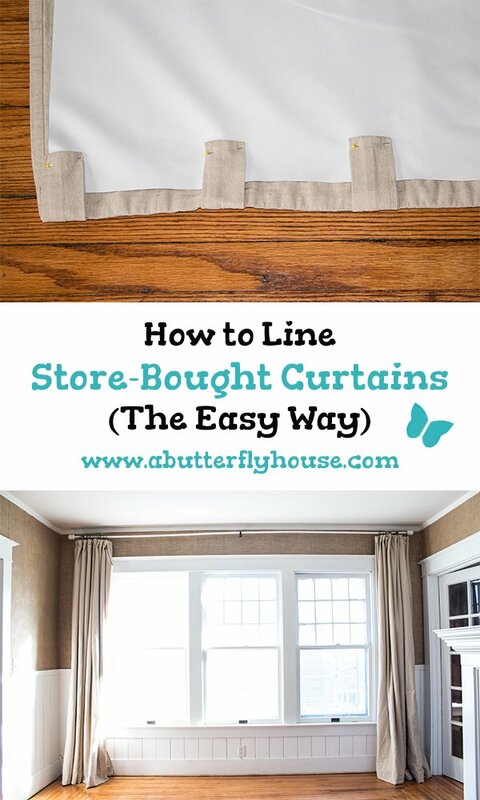 Arrange your blackout lining on top of the curtain. Since my windows don't reach all the way to the floor, I cut my fabric a little bit short of the curtain. That way, I can save on blackout lining! At the top of the curtain, pin the blackout lining in place. I try to place my lining/pins so that my new seam will be close to the original stitching that's at the top of the curtain. I wanted to use curtain rings instead of the tabs, so I folded over the tabs of the curtains and sewed them at the same time as the blackout lining. If you're not doing that, just pin the fabric normally! 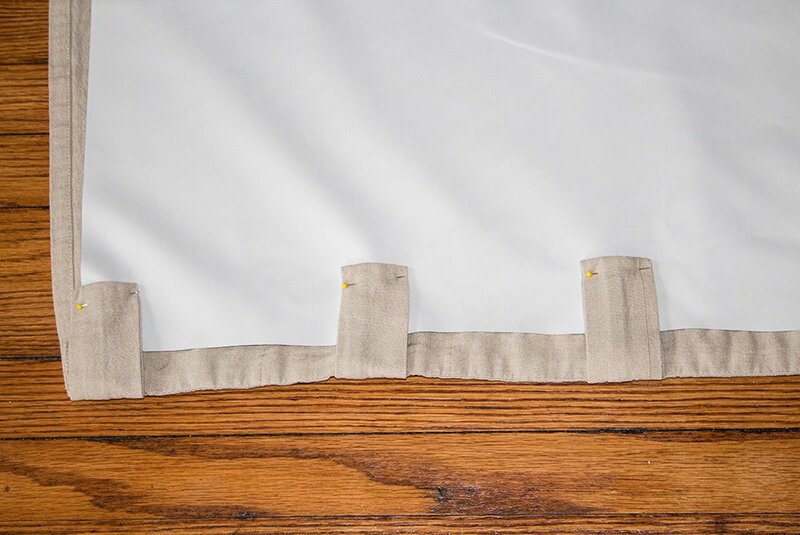 Attach the blackout lining to the curtain by stitching a single line across the top of the curtain. And that's it. You're done. Why aren't you stitching the other three sides, you might wonder? Because that takes skill, apparently. I tried. But it's difficult to align the fabric evenly, and so when I did my mediocre job, it did not look attractive. I did not take a picture, I'm sorry, but trust me when I say it looked bad. Plus, blackout lining is stiff. It makes curtains look stiff. 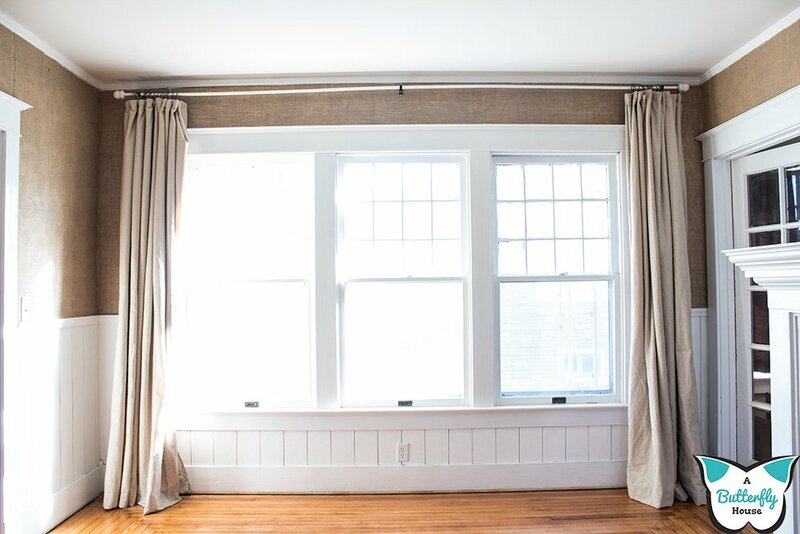 By only having it sewn in at the top, the curtain you purchased remains its original, flowy self. The blackout lining just sits behind the curtain blocking the light, but not actually affecting the look of the curtain. I love them! 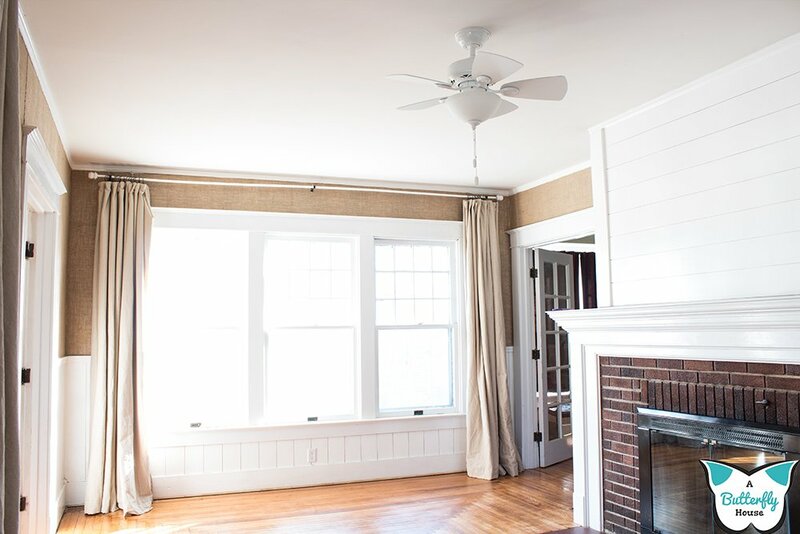 I think they're the perfect neutral for matching both the burlap top half of the wall and wainscoting bottom! I DIY-ed the curtain rods as well; go check them out! 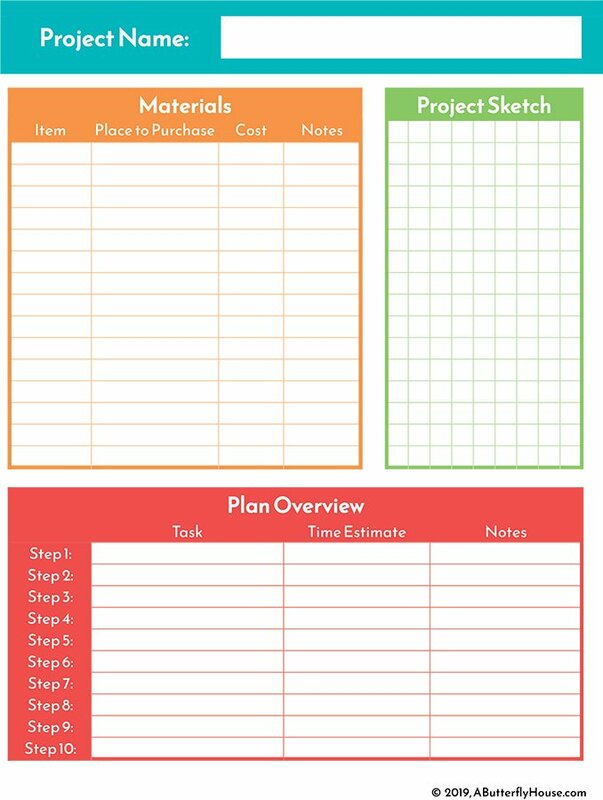 If you found this useful, go ahead and save it to Pinterest so you can find it when you have curtains to line!